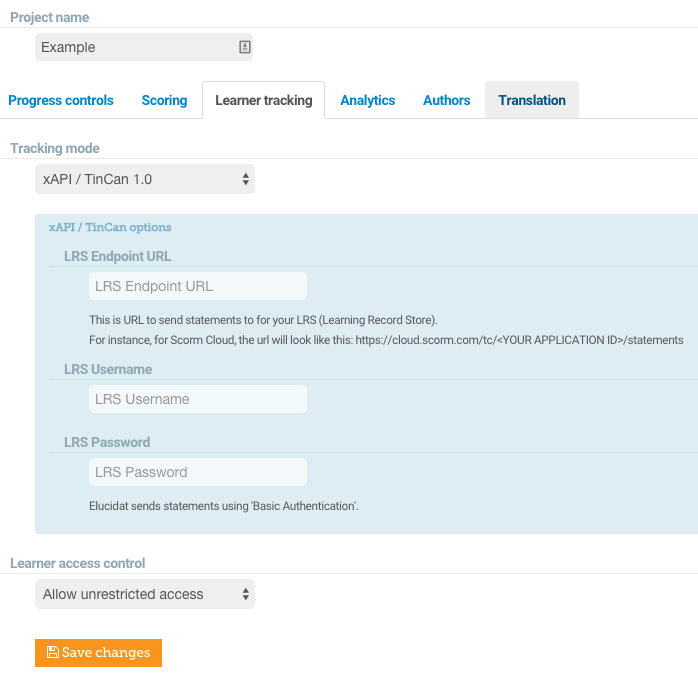 Using an LRS saves your Learners from the hassle of logging in to an LMS. From the ‘Tracking mode’ dropdown select ‘Tin can 1.0’. Learner access control: Here you can control security settings for your course (this only applies to courses built in ‘Tin Can’ mode). When using ‘Tin Can’ mode you will need to choose the ‘Identify setting’, this means your Learner will be required to enter their email address and then follow a link that is sent to them. If you don’t have an LRS already, SCORM cloud is a great place to get started. Firstly create a SCORM Cloud account (https://cloud.scorm.com). Log in to SCORM Cloud. Click the ‘LRS’ tab on the left of the screen. In the box that says ‘LRS endpoints’ you will see 4 URLs. Copy the first one. Open your course in Elucidat. Press the ‘Learner tracking’ tab. Now from the ‘Tracking mode’ dropdown select ‘Tin Can 1.0’. Now in the box titled ‘LRS Endpoint URL’ insert the URL that you copied from SCORM cloud, at the end of the URL add ‘statements’. Head back to SCORM Cloud. In the box titles ‘LRS Endpoint URL’ copy the code displayed next to ‘Key’ open Elucidat and add this into the ‘User’ box. Do the same for ‘Secret’ (also in the ‘Activity Providers’ section) but copy this into the ‘LRS password’ box and then press ‘Save changes’. Press ‘Show details’ and in the ‘Authentication type’ dropdown choose ‘Basic auth’. Please note that this feature is not intended for use with ‘Multi-Language Release’ .